When drivers suspect they’ve had a few drinks too many, one of the best things they can do is park their vehicles and get them off the road. But when they’re at risk for a DUI in Los Angeles–or any other jurisdiction, for that matter—they should be careful to determine whether or not their parking spot is a good one. Hung Tran, 54, didn’t do a very good job in selecting the place to park his vehicle. 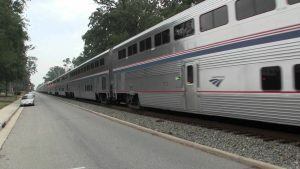 He left it on the train tracks near Hanahan, South Carolina around the time that the Amtrak Auto Train Number 52 was heading to that same spot. Tran did manage to get out of his vehicle before the train hit, but the impact caused a large crash (heard by nearby neighbors) and delayed travel along the tracks for three hours. Fortunately, no one on the train suffered injuries. When police gave Tran a breathalyzer exam, they measured his blood alcohol content at .15 percent—almost twice the legal limit. He now faces DUI charges. Just a few weeks before the South Carolina incident, Margaret Cole, 57, drove her car onto tracks at a former train station in Wallingford, Connecticut. Police summoned to the scene smelled alcohol on Cole’s breath and gave her a field sobriety test, which she failed. Officers charged her with DUI and failure to drive in the proper lane (which seems a bit of an understatement). Although cars are likely to come out the loser in any encounter with a train, a parked car left on the tracks can cause some serious damage to a train and injuries to passengers. Under California Vehicle Code 23153, a DUI driver who causes injuries may face felony charges (and their harsher penalties). Causing property damage may result in an enhanced (i.e. more severe) sentence as well.